Frugal & Fabulous: Review: Neocell Supplements - My Beauty & Health Secrets! Review: Neocell Supplements - My Beauty & Health Secrets! In the past year my husband and I have gotten really interested in health supplements. We take different supplements to better our health and to fight against inflammation. So when my friends at Neocell asked us to review some of their supplements we were really excited! The first product I tried was Biotin Beauty Bursts in Acai Berry. 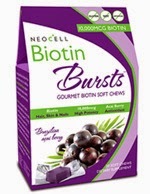 NeoCell Biotin Bursts deliver high potency beauty nutrients in a delectable, gourmet soft chew. These chews are sweet and taste like a candy, with a consistency of a chewy taffy. There is 10,000 MCG of Biotin per chew which helps to improve the health of your skin and hair. I've been taking the beauty bursts for a few weeks now and I have totally noticed a difference! My nails are longer and stronger and my hair is shinier. This is because of the Biotin! It is scientifically formulated to support metabolism of proteins in the body promoting natural energy, luxurious hair and vibrant skin. These are easy to take and fun to eat. I've even caught my husband trying to eat them! The second product I tried was Neocell's Pomegranate from the seed supplements. Pomegranate is a a strong antioxidant and anti-inﬂammatory agent. Pomegranate's Legendary health beneﬁts date back over 5,000 years, spreading throughout the Far East, Near East, Mediterranean, India, Africa, China, Europe, and the Americas. Modern scientiﬁc studies reveal Pomegranate extract as one of the most active and superior antioxidants, higher than red grapes and green tea. The extraordinary antioxidant properties protect the body from free radicals and its unique potency provides signiﬁcantly dramatic results when compared to other antioxidants. Prior to taking these supplements, my husband and I were buying pomegranate juice to get the same health benefits. The problem with that, is that pomegranate juice can be very expensive. It also has a high sugar content. So we were happy to hear about Neocell's Pomegranate from the seed supplements - it's a great, affordable and more practical alternative! Buy it: Neocell products are available at Vitamin World, GNC, Whole Foods and more! Click here to locate a retailer near you! Has three times the antioxidant beneﬁts compared to the similar amounts of green tea or red wine. Do you take health supplements? Let me know!